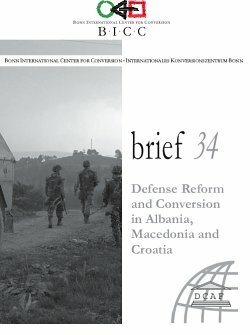 BICC brief 34 deals with the military reform and the defense conversion process in Albania, Macedonia and Croatia. Among the issues covered are the adoption and implementation of strategic-doctrinal documents, and the modernization and downsizing of armed forces, including the reintegration measures for redundant personnel and the arrangements for sale and conversion of military bases. The current goal of defense reforms in Albania, Macedonia and Croatia consists mainly of establishing small, modern, effective, deployable and interoperable professional armies. With the adoption of strategic documents, legal frameworks, and with the downsizing of personnel already in an advanced stage, the essential yardsticks of defense have been met. This brief concludes that the reforms have been guided primarily by external actors, namely by NATO, foreign Private Military Companies (PMC) and bilateral support by the US and various EU countries. All three countries consider these reforms as a test of their capability and willingness to adopt and implement the rules and standards of NATO as well as a step towards potential EU membership in the future. The findings of this brief further show that the defense reform process in the Western Balkans is complex. This is because it involves not only the improvement of civilian and democratic oversight and the modernization of the armed forces and the Ministries of Defense, but also the adaptation of the armed forces to the new global, regional and local strategic environment.